You aren't using those toolbar buttons. Certainly not all of them. In fact, ScottGu once bet a group that they couldn't name every button from left to right. In some cases toolbars get added, then added and forgotten about. But they are there, up there in toolbar-space and they are taking up not only pixels, but also mental space. Go ahead and take two minutes. Free your mind and clean house. Go setup your virtual development workspace and make it fresh and personal. 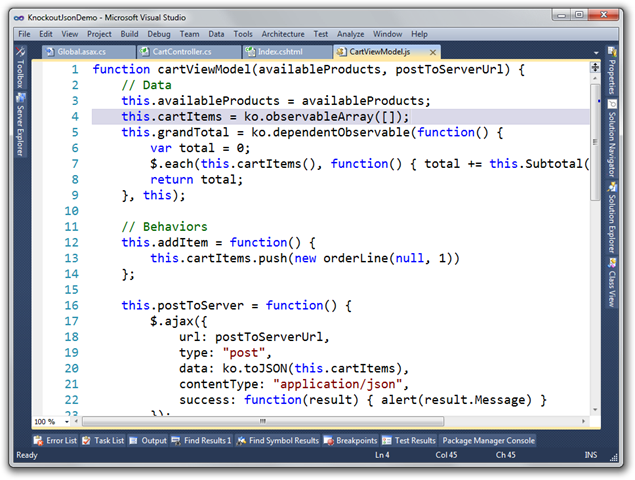 Change your colors and even make make the Visual Studio 2010 IDE colors look like Visual Studio 2008 if you want. Personalize. Get a nice Visual Studio Wallpaper (or three) from this collection of dozen of VS 2010 Wallpapers submitted by the community. Here's my Visual Studio after cleaning house. It feels faster (it's not) and it looks cleaner and it imposes less psychic weight on me. Right click on your Toolbar and remove the ones you don't use. Even better, while you're in customize mode, grab just those commands that you use (maybe ones that aren't on your toolbar even though you use them) and get rid of ANYTHING you don't use every day. Now, all those docked/pinned Tool Windows? Close the ones you don't use every day. Ah, to use a Rob Conery-ism, it's like rolling up the window in you car while driving on the freeway. Next, head over my friends at http://studiostyl.es and get a nice Visual Studio Color Scheme and then a new Wallpaper from http://vs2010wallpapers.com. Or, get creative and submit your own creation to both sites! I would also suggest using this extension to hide the File menu until you press the alt key. The backgrounds say that they are 1920x1280, but they are in fact 1280x720. So they don't cover the whole VS background area..
On a related topic, why did VS2010 SP1 add a new toolbar with a big button that just launches the Web Platform Installer? It's easily turned off, sure, but it's another baby step in the direction that got Office in so much trouble. Ok I found the PSD of the "Life runs on code" one and resized it down to 1600 in photoshop myself, that seems to fit perfectly. 1920x1280 was too big. You can also add toolbar buttons on the menu bar. I added Run/Break/Stop so they show up after the Help menu item. Those were the only toolbar buttons I used anyway. For the most part I like them because they are a good indication of whether I'm debugging or not. The comment about the color change is interesting. I took a good bit of time to make Eclipse look like Visual Studio, so it would be the same when going back and forth between Java at work and C# at second-work. I cleaned up my Visual Studio toolbars a few months ago, and it's great. You never realize just how many useless buttons are up there until you get rid of them. I would recommend keeping the Find in Files box, though. If you press Ctrl+/, that sets focus to it, and allows you to enter semi-arbitrary commands. For example, pressing Ctrl+/ then 'of' gives you an auto-complete list of any file in the current solution, and then opens it. It's quite handy, really. I would also reccommend turning off the status bar - the only useful information is what line you are on. I've tried no menu and no toolbars and I'm not a huge fan. I almost always get rid of tooboxes on the left, I keep just Solution Explorer/Navigator above Properties/Find and Replace on the right. Bottom is empty when I'm not in debug. I had my own VS light colors on dark (dark!) green, but I had too many issues with extensions not respecting colors or not dealing well with light on dark. Also, I think it has a startup cost. I had just ordered a new "small" development laptop for those long metro commutes every day. I think this will be the perfect solution to any real estate issues on the smaller screen. And then export your settings to a file so next time you install can just import your settings and start using it (or to port the exact same settings to your laptop) This has saved me MANY hours of "re-customization"
Great suggestion,but it is so hard building your custom toolbar with just what you need. What we really need here is a filter on all the commands you can add (on the customize dialog box), it takes forever to find the ones you need as there are so many. A simple textbox that filters the commands would be great. One thing that missing from this post is Shortcuts. If I use more shortcuts, I'll need less toolbars. Funny, I did this myself just recently. I went through each button with the condition that if I could remember having used it at least once in the last year, it could stay. By the end I have about 7 or 8 left. It definitely gives you a psychological boost to do it, like customising your theme and code formatting, you feel like you're more in control of your working environment, and that the IDE isn't just a piece of software, but an extension of your way of doing things. I used Jeff LeBert's suggestion to add the few buttons I use to the menu bar, but there is one I use that I can't find. Does anyone know how to add the "Target Deployment Device" dropdown? This is for selecting the phone emulator or phone device. It is on the Standard toolbar, but I can't find it in the list of commands to add to a menu bar or tool bar. Line numbers. They are the worst distractors, but I can't live without them. So, I changed their colour to a very pale gray. Great post. Most people don't realize how important it is to customize our (software) environment. It definitely greatly increases productivity and endurance. Scott, thanks for reminding us of this important aspect - it's all part of the 'sharpen the saw' approach, IDE is our saw and we have to sharpen it and *make it our own* so that it works best for our own needs. I've used Jeff LeBert excellent suggestion to add toolbar icons to the menu. Much neater. I only need help will two things and I'll be as happy as a pig in mud. 1) Close all but pinned. I'm sick of right click first. 2) Add the MercurialToolbar from CIDesigns to the menu then I have no toolbar line! I'm now as happy as a pig in mud. I've set Shift+F4 as shortcut to close all but pinned documents. 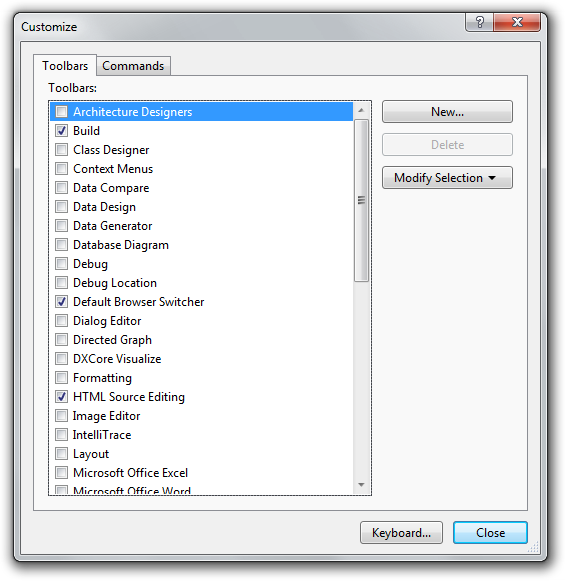 See http://stackoverflow.com/questions/5286178/how-to-add-close-all-but-pinned-command-to-visual-studio-2010-menu-or-toolbar. I've turned off MercurialToolbar from CIDesigns and added required Mercuial commands to the menu via macros. Here is the macro to commit. OFFTOPIC: Hey, even you get spammed in your comments section. ONTOPIC: Altough I agree that to much buttons up there are a distraction, I do feel that having a quick way to access some functions will help productivity. An example: some would say, you don't need the Run button on the toolbar, just hit F5 instead. However, when I'm working on some settings, or doing some other mouse intensive thing, I prefer to click the button, instead of having to hit a key on my keyboard, so I keep the run button on my toolbar. Still, a good suggestion, that I will take to heart. One of the biggest improvements I've made is moving the solution explorer and properties windows onto my secondary monitor. They're still there when I need them and they're easier to access and are always visible which makes them way more useful than when they're hidden and you have to hover over them to open. I have simplified my toolbar creating a new one and placing only the button that I actually use. Eduardio - I love your toolbar! Also, consider switching VS to full-screen mode. Especially useful when developing on a laptop and screen real estate is a luxury. Hm.mmm But what about Solution Configuration (Debug/Release) and target for WP7 project (Emulator/Device). Is there any other ways to select it without toolbar? What people don't always realize is the productivity of multi monitor systems. A vertical 1080p for the code and all Toolboxes in another horizontal 1080p with any of messenger, music player, processXP and other applications you keep an eye on. One more vertical screen for a browser (altough that makes a lots of tabs a little squeezed... some may prefer horizontal, but that's a little clumsy). And a main horizontal screen where you run the application you are coding (and that's also where you show any temporary application). That totals to 4 screens, two horizontal one over the other and two vertical, one on each side. I went for 23", but slightly bigger vertical ones might allow you to make the font smaller and see more. I used to to this with VS <= 2008. One of my biggest frustrations with VS2010 is how they've neutered the toolbar customisation. It used to be as easy as drag/drop. Now you have to hunt through an extremely clumsy interface to try and construct your own toolbars. I hate it to the point that I simply don't bother. I just remove the icons I don't want and can't be bothered manually searching for the commands I want. Thanks Scott! The color themes really helped in making my boring job slightly more interesting. Now I can get out of bed without groaning everyday! Can you promise that if I do this, the next version of Visual Studio won't use the Ribbon. I used to have awesome toolbars configured in my word.dot file back in the Office 2000 days, completely hiding fonts, bold etc., in favour of using styles, and fitting cross references on to boot, only to find that I had fonts back on the Ribbon and had to switch to the insert tab to insert cross references in Word 2007 and 2010. I grew to like some things about the Ribbon in Word, but still wish I could have half the main and half the insert in one tab to stop having to go back and forth.